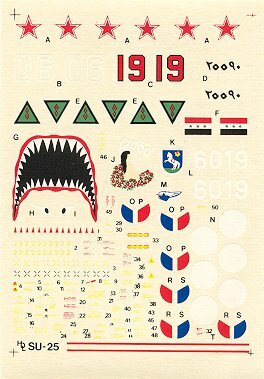 This sheet offers the modeller 4 different decal options for Soviet, Czech and Iraqi Su-25's. 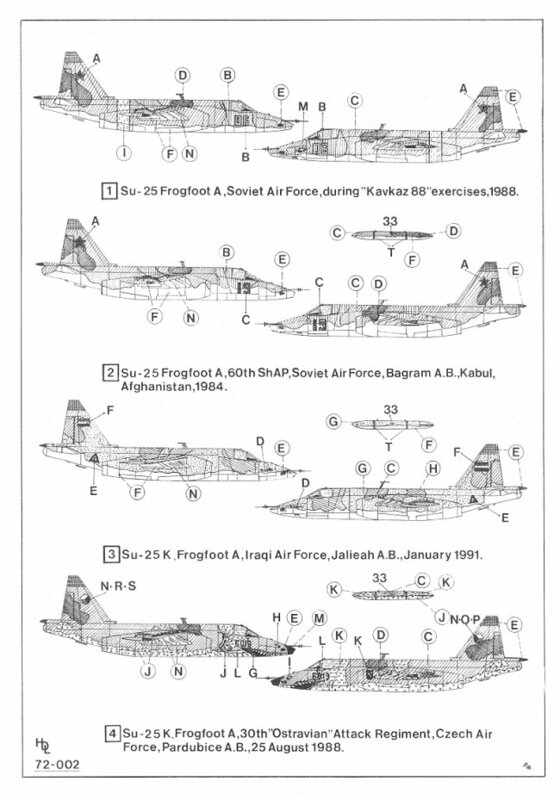 The planes covered on this sheet range from an Iraqi Su-25 from Jan 1991 during the peak of Desert storm to a Soviet Su-25 based at an airbase outside Kabul in 1984. Paint schemes range from Brown-yellow/Dark Green/ Dark Brown camo of the 2 Soviet jets to Dark Green/Earth Brown/Sand of the Iraqi jet to the Dark Green/Dark Brown/Tan camo of the Czech Su-25. 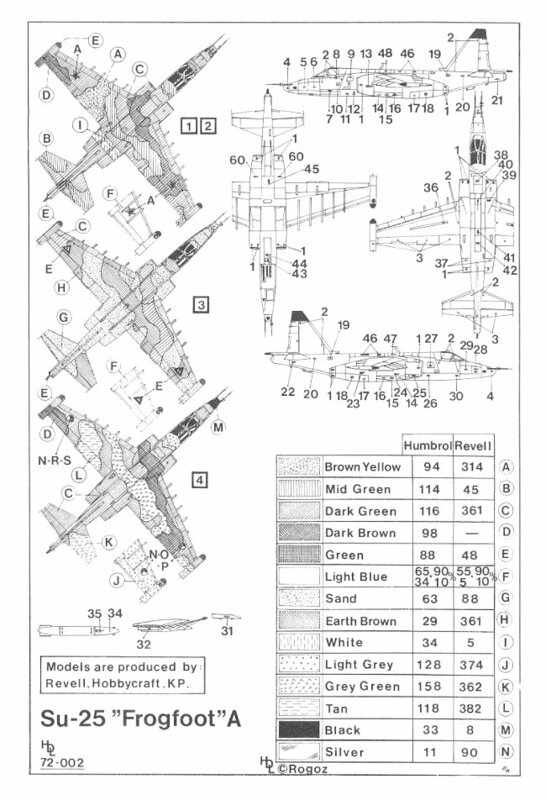 There are enough stencils included to do one of the four Su-25's featured on this sheet, although with additional stencils all 4 Su-25's could be made. The first decal option is for a Su-25 Frogfoot A of the Soviet Air Force during "Kavkaz 88" exercises in 1988. This jet is Brown-yellow/Dark Green/ Dark Brown camo and light blue on the underside with a white rear fuselage band and silver weapons pylons. The second decal option is for a Su-25 Frogfoot A, 60th ShAP, of the Soviet Air Force out of Bagram airbase near Kabul, Afghanistan in 1984. This jet is Brown-yellow/Dark Green/ Dark Brown camo and light blue on the underside with a white rear fuselage band and silver weapons pylons.  The third decal option is for a Su-25K, Frogfoot A of the Iraqi Air Force out of Jalieah airbase in January 1991 at the peak of Desert Storm. This jet is Dark Green/Earth Brown/Sand camo and light blue on the underside and silver weapons pylons. The fourth decal option is for a Su-25K, Frogfoot A, 30th "Ostravian" Attack Regiment of the Czech Air Force out of Pardubice airbase on August 25 1988. This jet is Dark Green/Dark Brown/Tan camo and light blue on the underside and silver weapons pylons. This particular paint scheme includes a sharks mouth. These decals are clearly printed in register and appear very thin, so they should conform beautifully. The small stencil writing is not readable on the 1/72 sample I have before me.